The 10 Best French Fries in Utah! Some like them soft, some like the crisp. French fries: the starch to rule them all. Whether or not you want to admit it, you’re probably craving them right now. And if you’re in Utah, you’re in luck. These 10 Utah locations cook up some mean, deep-fried strips of potato. Definitely a recognizable Utah staple, Bruges Waffles & Fries started in Salt Lake City but has since spread across the state. Never fear though, the restaurant has somehow also managed to maintain its Flemish charm. And as good as a Bruges waffle is, the fries are easily number one. Dominating nationwide fast-food in Utah Valley, JCW’s is a hot spot for shakes, burgers, fries, and a delicious take on the Utah specialty known as fry sauce. 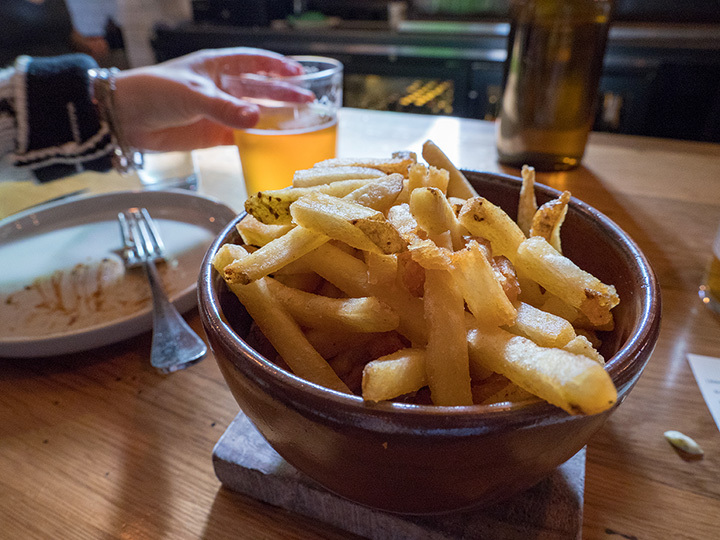 These fries are thick, the perfect combination of soft and crisp, and come in shockingly large portions. If you’re craving double fry duty, the cheese fries are also easily worth the extra room in your stomach. Drawing inspiration from his days working at a Chicago beef joint in the windy city, the founder of Cubby’s decided to bring tender beef, kale salad, and killer sweet potato fries under one roof. But seriously, crinkle-cut fries are worth at least two orders (or three). When you talk burgers, fries, and shakes in Utah, it’s inevitable you’ll hear about the Burger Bar. A bit out of the way in the smaller city of Roy, Utah, the Burger Bar nevertheless attracts crowds from across the state. Yes, this place is reportedly home to Utah’s best burger, which is apparently rivaled by its fried counterpart. Similar to the Burger Bar in its tried and true quality, Hires Big H Drive-In has seasonal milkshakes, homemade root beer, classic burgers, and skin-on fries that are just waiting to be dipped in their state-wide famous fry sauce. With three locations in the Salt Lake Valley, Spitz has quickly become a Utah favorite. And while you’d typically expect awesome French fries from a classic burger joint, Spitz is Utah’s premier spot for a döner kebab. If you’re not sure what that is, you should go and find out. In the meantime, you can dream of the restaurant’s “Street Cart Fries” that are topped with garlic aioli, feta cheese, and a number of other toppings of your choosing. An Asian fusion restaurant with an unexpected name, Bumblebee’s BBQ & Grill serves up Korean inspired bulgogi fries that will knock your socks off. And if you’re unfamiliar with Korean flavors, there is no need to worry. This is something you’ll like, guaranteed. An unusual type of food in Utah, East Coast style sandwiches with “Italian flair” have nevertheless made their mark. At Moochie’s, your vegetable, meat, sandwich, and fry fantasies are made into realities. Fries here are listed as “Crispy Fries,” meaning, you know exactly what you’re getting, and it’s going to be good. Yes, vegans and vegetarians like fries too. At Vertical Diner in Salt Lake City, this is a simple, well-known truth. Happy to be a vegan but missing your cheese fries? The Vertical Diner has you covered. Middle Eastern food meets French fries. Make no mistake, this is a combination worthy of high praise. With great service, interesting and delicious food, and perfectly textured fries, Mazza is worth your attention and Friday night.